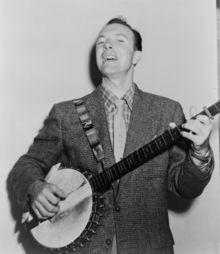 Peter Seeger, better known as Pete Seeger, is a folk singer, political activist, and a key figure in the mid-20th century American folk music revival. As a member of the Weavers, he had a string of hits, including a 1949 recording of Leadbelly’s "Goodnight Irene" that topped the charts for 13 weeks in 1950. However, his career as a mainstream performer was seriously curtailed by the Second Red Scare: he came under severe attack as a former member of the Communist Party of the United States of America. Later, he re-emerged on the public scene as a pioneer of protest music in the late 1950s and the 1960s.